Magnetic materials can host a range of structures called spin textures. Two such textures — a meron and an antimeron — have been observed experimentally for the first time, in a material known as a chiral magnet. Seonghoon Woo is at the IBM Thomas J. Watson Research Center, Yorktown Heights, New York 10598, USA. Magnetic moments (spins) in magnetic materials can form various structures known as spin textures. In most cases, spins of neighbouring atoms tend to align parallel or antiparallel to each other, resulting in ferromagnets or antiferromagnets, respectively. However, in some materials called chiral magnets that have unusual physical interactions between spins owing to a peculiar crystalline or multilayer structure, spins align in an intricate fashion: a topological spin texture. On page 95, Yu et al.1 report the first experimental evidence for two such textures, and observe transitions between textures that could have applications in spin-based electronics (spintronics). The archetypal topological spin texture is a small, swirling magnetic knot known as a magnetic skyrmion (Fig. 1). In a skyrmion, the orientation of spins rotates progressively from the up direction at the edge of the texture to the down direction at the centre, or vice versa. The properties of a skyrmion can be characterized by a value of either –1 or +1 for a quantity called the topological charge. Magnetic skyrmions were discovered2 in 2009 and were observed at room temperature3 in 2015. Since then, they have been at the centre of research in many scientific and technical fields, for at least three reasons4. First, they can be very stable, owing to a phenomenon called topological protection. Second, they can be extremely tiny (with diameters in the nanometre range), which means that they could be used in future nanotechnology. And third, they exhibit energy-efficient current-driven behaviour that is suitable for next-generation low-energy spintronic devices such as those involving computer memory, logic, information transmission and neuromorphic (brain-like) computing. 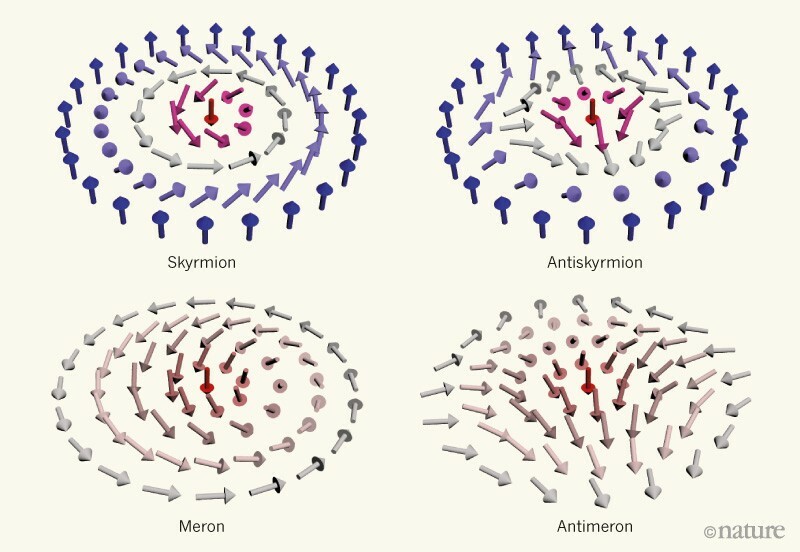 The remarkable properties of magnetic skyrmions have inspired strong worldwide research efforts looking for the other types of topological spin texture that could exist in chiral magnets: antiskyrmions, merons and antimerons (Fig. 1). In 2017, antiskyrmions were observed5 in chiral magnets called acentric tetragonal magnetic Heusler compounds, which have unusual crystal structures. However, merons and antimerons have been elusive. Figure 1 | Topological spin textures in a chiral magnet. In materials known as chiral magnets, magnetic moments (arrows) can form intricate patterns called topological spin textures. The four types of texture that could exist in a chiral magnet are skyrmions, antiskyrmions, merons and antimerons. Yu et al.1 report the detection of merons and antimerons in a particular chiral magnet, and the observation of transformations between topological spin textures. The colours indicate the spatial direction of the magnetic moments out of the plane of the material, from the up direction (blue) to the down direction (red). The schematics show textures that have particular values for a quantity known as the topological charge: −1, +1, − ½ and + ½ for the skyrmion, antiskyrmion, meron and antimeron, respectively. Skyrmions were initially considered in many areas of physics other than the study of magnetic materials. Likewise, the concept of merons and antimerons originated in classical field theory6 and was later applied to particle physics7 and to condensed-matter systems such as quantum Hall materials8 and chiral magnets and spintronics9. In chiral magnets, merons and antimerons have different topological properties from skyrmions. In merons and antimerons, the spins at the core region point in the up or down direction, but those at the periphery align in the plane of the material, corresponding to a topological charge of −½ or +½. Many theoretical studies in the past few years have asserted the possibility of the existence of merons and antimerons in chiral magnets that exhibit in-plane magnetic anisotropy10,11 — a property in which the response of the material to a magnetic field is largest when the field is directed along the plane of the material. Yu and colleagues tested this prediction using a thin film of a chiral magnet containing cobalt, zinc and manganese that has a cubic crystalline structure and in-plane magnetic anisotropy. The authors carefully engineered the material composition of the film, because they found that the composition had a substantial effect on spin texture. Yu et al. then carried out highly sophisticated spin-visualization measurements of the synthesized magnetic film using a technique called Lorentz transmission electron microscopy. This technique could resolve spin orientations using the interaction between electrons from the microscope and the spins in the presence of a magnetic field. The authors performed spin-texture imaging at various temperatures and magnetic-field strengths. On the basis of these observations, the work presents several key achievements. Yu and colleagues are the first to have observed merons and antimerons in a chiral magnet. When the authors applied a magnetic field of 20 millitesla perpendicular to the magnetic film at a temperature of 295 kelvin, they observed a stabilized square lattice of merons and antimerons. Such a lattice is characterized by periodic arrays of alternating convergence and divergence of magnetization. 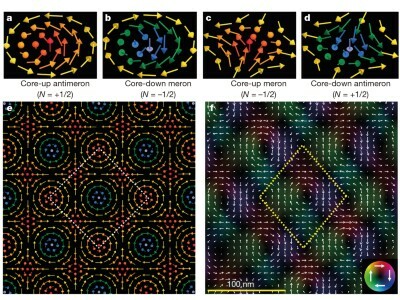 Unlike the typical hexagonal lattice of skyrmions, in which no antiskyrmions exist, it is noteworthy that the observed square lattice contained both merons and antimerons — a configuration that was often considered as a separate spin texture, called a bimeron, in previous theoretical studies12. A more substantial achievement of Yu and colleagues is their demonstration that the square lattice of merons and antimerons could be transformed into a hexagonal lattice of skyrmions by increasing the strength of the applied magnetic field. The authors began with a square lattice of merons and antimerons, whose spins at the core regions pointed in the down and up directions, respectively, in the presence of a perpendicular magnetic field of 20 mT. They increased the field to 60 mT and found that the spin orientations changed completely, and the hexagonal lattice of skyrmions was stabilized. Finally, by lowering the temperature from 295 K to 120 K, Yu et al. compared the stability of the observed spin textures. The authors discovered that the hexagonal lattice of skyrmions is more robust than the square lattice of merons and antimerons, because skyrmions exhibit greater topological protection than do merons and antimerons, in agreement with previous theoretical suggestions13. The findings are important because they suggest that many or all kinds of topological spin texture can be realized in a single chiral magnet, and also that a specific spin texture can be selected, depending on the required stability or other characteristics. Although Yu and colleagues’ work is a major step forward in the fields of chiral magnetism and topological spintronics, practical applications of the observed spin textures could require further breakthroughs. One challenge is that precise control over the crystalline structure and composition of the material is crucial. Such a requirement might limit applications that require high robustness. Moreover, the current-driven behaviour of the textures that is of relevance to spintronics has not yet been observed. Nevertheless, Yu et al. have achieved a key experimental discovery that could inspire future engineering efforts in electronic devices that use rich topological spin textures. Yu, X. Z. et al. Nature 564, 95–98 (2018). Mühlbauer, S. et al. Science 323, 915–919 (2009). Jiang, W. et al. Science 349, 283–286 (2015). Fert, A., Reyren, N. & Cros, V. Nature Rev. Mater. 2, 17031 (2017). Nayak, A. K. et al. Nature 548, 561–566 (2017). De Alfaro, V., Fubini, S. & Furlan, G. Phys. Lett. B 65, 163–166 (1976). Callan, C. G., Dashen, R. & Gross, D. J. Phys. Rev. D 17, 2717–2763 (1978). Brey, L., Fertig, H. A., Côté, R. & MacDonald, A. H. Phys. Scr. 1996, 154 (1996). Ezawa, M. Phys. Rev. B 83, 100408 (2011). Lin, S.-Z., Saxena, A. & Batista, C. D. Phys. Rev. B 91, 224407 (2015). Ozawa, R. et al. J. Phys. Soc. Jpn 85, 103703 (2016). Zhang, X., Ezawa, M. & Zhou, Y. Sci. Rep. 5, 9400 (2015). Nagaosa, N. & Tokura, Y. Nature Nanotechnol. 8, 899–911 (2013).